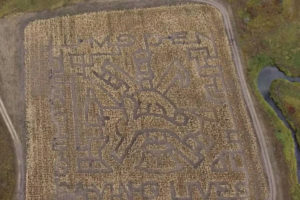 An aerial photo of Happy Hollow’s corn maze near Lumsden, Sask., honouring the efforts of local firefighters who helped save the business from fire last spring. Submitted photo. Tiffany Schaefer remembers well the afternoon she almost lost her property to a grass fire. The owner of the Happy Hollow Corn Maze in the Lumsden Valley was home with her children on the afternoon of April 26 when she saw the smoke in the distance. Schaefer and her neighbours were forced to flee while firefighters from Lumsden and surrounding communities put out the blaze. They were lucky. Nobody was hurt and the only property lost was a shed housing some of the Schaefer’s farm equipment. He said his crew will be acknowledging the kind gesture. Schaefer is thrilled that they want to support her business. That’s why she is inviting all first responders and their families to enjoy a free visit to the maze Saturday and Sunday. The maze will still be open to the public, with admission at $13 per person. One dollar from every ticket sold on Saturday will be donated to the Lumsden Volunteer Fire Department. Schaefer is also thankful for the other fire departments who came to help the day of the fire, and her neighbours who provided their own equipment, such as water tanks and trenching vehicles. Details for the weekend event can be found on Happy Hollow’s Facebook page and on its website, happyhollow.ca.